Director of the Department of Small and Local Business Development, Ana Harvey, Chairman and CEO of Gallup, Jim Clifton, Ray Hutchison of DCPS, and local entrepreneurs welcome student-run business into the DMV entrepreneur community. Washington Builders, young entrepreneurs from DMV area, launch an apparel business in 5 weeks! Their market research, product design, sourcing, budget, inventory management, and sales are live. Now it’s time for these students to show off their business to the city! Many of the students are a part of DC’s Summer Youth Employment Program initiative to provide impactful internships with local businesses. The Washington Builders fashion is a showcase of what is on the hearts and minds of DMV teenagers. These students dream to be employers and leaders of future companies in the DMV area. 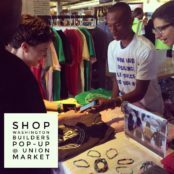 Their t-shirt designs represent how they hope to enact change as business builders in their communities. The event’s theme is “BOSS UP”; a call to action for us all to be leaders. Models include a DC tech start-up CEO, GWU basketball player, social entrepreneur chef, renowned Brazilian guitarist, break dancers, slam poet, and DC youth!